^ Robots and Robotics at the Space and Naval Warfare Systems Center Pacific 互联网档案馆的存檔，存档日期1999-02-20. ^ Jason Palmer. 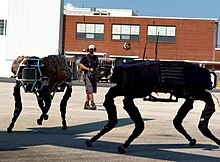 Call for debate on killer robots. BBC新聞. 2009-08-03: 科技報導 [2011-04-21]. ^ 江, 玟. 霍金等千名科學家連署 反對人工智能投入軍備競賽. 風傳媒. 2015-07-30 [2015-08-11].